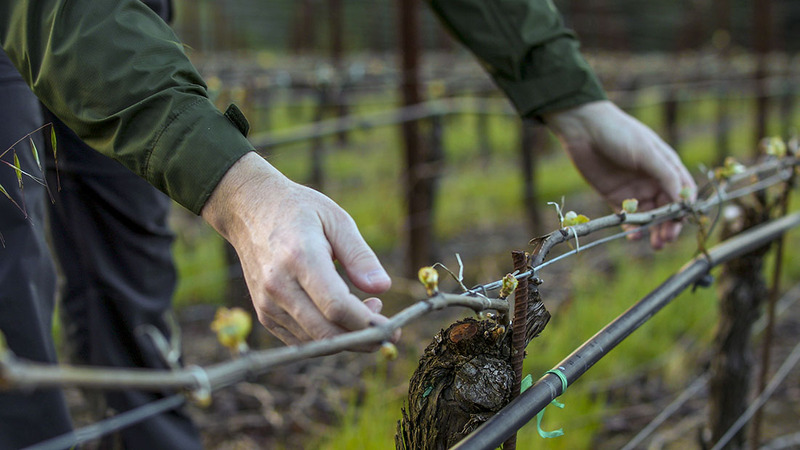 In 2008 we made the conscious decision to harvest at slightly lower maturity from the organically-farmed steep volcanic hillside of the Hoppe-Kelly vineyard that has produced our Eddie’s Patch bottling since the 2000 vintage. We were able to do this with confidence through a combination of expert, precision farming, eliminating irrigation throughout the growing season and through a strong desire to heighten the dynamic peppery, violet character of this wonderful grape variety. Because of this our new Eddie’s Patch offering relies slightly less upon extravagant fruit richness, but veers more toward the intense blue-fruited peppery side of the variety, in much the same way the phenomenal 2006 vintage performs. By eliminating irrigation, we have found that canopy growth slows and ceases earlier, prompting the vines to switch to fruit ripening more uniformly. The vines it seems are also more able to withstand heat spikes, such as we witnessed in early September and furthermore berry size is reduced creating greater extraction potential. As the wine opens, the fruit notes come to the fore to support the meaty, tarry aspects that this vineyard naturally produces. It’s an intriguing combination that’s for sure. Dark ruby purple; dark complex brooding aromas of earth, meat, tobacco and tapenade open to sweeter blackberry floral notes. Cassis, graphite and violet lead to dried herb and savory notes on the palate. As the wine opens, the natural fruit sweetness develops with a smoky mineral streak and bittersweet chocolate notes. Round elegant tannins offer grip and density to the lingering finish. Cellar for at least two years or decant before serving. Drink between 2012 and 2020.